The most time-consuming aspect of this dish, is measuring out all the ingredients used in the soup. If you like asian flavors, I’m pretty sure you’ll probably have most of these sauces in your kitchen already. The recipe is adapted from Noodle Comfort – Easy Japanese Cooking. Interestingly though, according to the book, the soup is served cold over hot noodles with spicy meat. I liked it, but it becomes luke warm real fast and is probably better suited for warmer climates. I really liked the flavors and made it again with hot soup and this is the version I will recommend. Heat sesame oil in wok over low heat. Chop ginger and garlic and fry until fragrant. Add the pork, salt and pepper and stir fry the meat while breaking it apart. Meanwhile boil the water for the soup and measure out all the ingredients. Add them to the hot water and stir. The soup should not boil after adding the miso. When the meat is browned, add the mirin, soy sauce and oyster sauce. Finely chop the green onions and add to the meat just before serving. 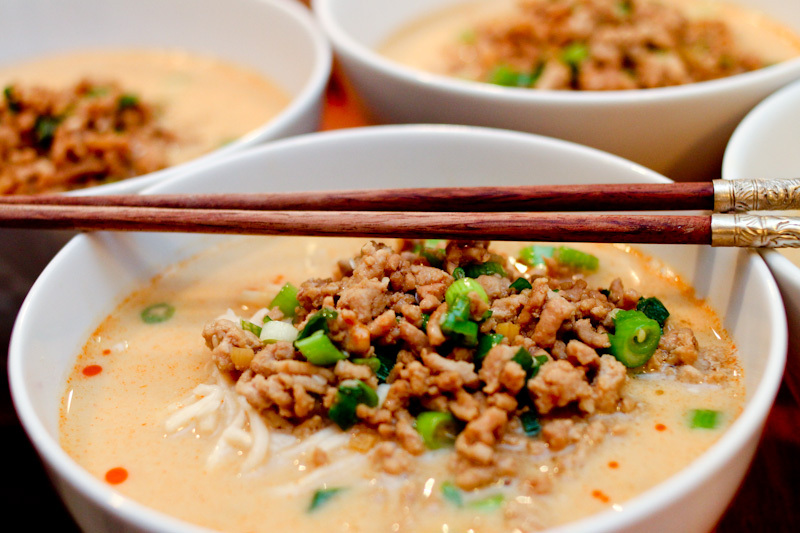 Assemble the dish by diving the noodles in four bowls, then pour the soup and top with the spicy meat. Drizzle with drops of chili oil and serve hot. This entry was posted in Asian inspiration, Dinners in 30 min or less, Soup time and tagged asian noodle soup recipe, japansk nuddel suppe, japansk suppe opskrift, krydret nuddel suppe, spicy meaty soup, tan tan noodle recipe. Bookmark the permalink.